As children grow up, they reach a point in their lives where the decisions they make begin can affect them for the rest of their lives. Events are stepping stones that can lead you in the right or wrong direction. For example, my decision to take a job at the computer lab in college led to learning about an on-campus internship, which led me to secure my first job out of college where I still work today. My son has reached this point, so when I see him making a mistake I want to help him see the error of his decision and guide him in the right direction. My son decided to have one of his overnight gaming parties, knowing full well he had to work at 7 am. I spoke with him several times reiterating the fact that he was scheduled to work. He even told me what time he planned to get up and get ready. The next morning, he came up from the basement after being up all night and said, â€œThere’s no way I’m going into work.â€ He contacted his manager and curled up on a couch with a blanket. â€œSo you’re not going into work?â€ I asked. â€œNope, I don’t feel well,â€ he responded. When he doesn’t show up, either someone else will have to change their plans and go to work unplanned, or the people that do show up will have to work harder to make up for his absence. This job is his only work experience, and thus his boss could be used as a recommendation. If his boss begins to view him as unreliable, that could be communicated whoever is screening applications for the on-campus job he’s applying for at the IT Help desk. If he could get that job, the experience there could help him use it as a stepping stone to bigger and better jobs leading into his career after college in the IT field. He has trips planned this summer to Texas and Arizona. These trips will take cash to pay for them. Every shift he doesn’t work is a loss of income that could help him pay for these trips. Knowing that he had to work in the morning but deciding to stay up all night suggests a lack of personal responsibility. Nobody will be there in college to make sure he studies enough, turns in his homework, or even goes to class. If he can’t make the decision to go to his job, does he have what it takes to be successful in college or life? My son made a bad decision and didn’t go to work after being up all night. While it didn’t seem like a big deal to him at the time, this decision affected others at his place of employment, his income stream, and potentially his ability to get his next job. I just hope it was a momentary lapse in judgment by a young adult and not a sign of a bigger underlying problem. 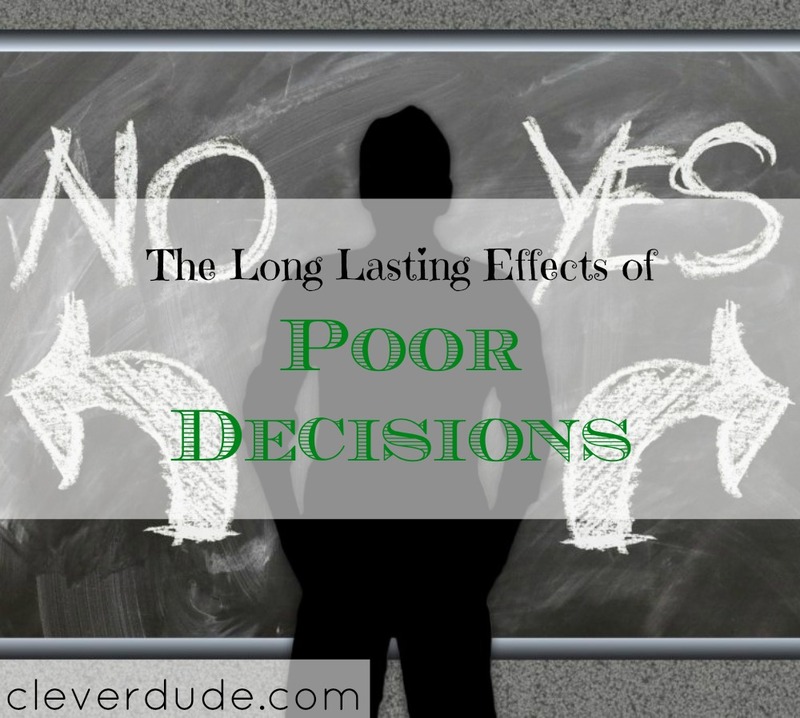 How about you, Clever Friends, can you think of a time you made a decision good or bad that had long lasting impacts in your life? He will figure it out eventually.